Bob Tuxford’s flying career began as a flight cadet at the Royal Air Force College Cranwell in 1967. After graduating with his ‘wings’ in 1970, he completed his advanced flying training at RAF Oakington on the Varsity, and was posted onto Mk 1 Victors employed in the Air-to-Air Refuelling (AAR) role at RAF Marham. After 2 years as a co-pilot, Bob was retoured as a captain on No 214 Sqn where he eventually became an Instrument Ratings Examiner. Following a hugely enjoyable tour in the RAF’s Tanker Force, Bob was rewarded with an accompanied overseas exchange tour flying with the USAF at Mather AFB in California. Flying KC135A Stratotankers, Bob was able to balance his RAF Probe and Drogue AAR experience with that of Strategic Air Command’s Boom Refuelling system. Acting as the Sqn Operations Officer, Bob further enhanced his position by upgrading as an Instructor Pilot midway through his tour. On return to the UK in late 1979, Bob applied to CFS at RAF Leeming to become a QFI on the Jet Provost and spent the next 18 months instructing at No 2 Sqn, RAF Church Fenton. He was recalled to the Tanker Force in 1980 to fill the Pilot Leader’s position on No 57 Sqn – back at RAF Marham. Flying the upgraded Victor K2, he was transferred on 1st April 1982 to Marham’s other Tanker Sqn, No 55, as a Flight Commander. Within less than 3 weeks, after a period of intensive flying that included an introduction to low level and photo and maritime reconnaissance (MRR) training flights, Bob deployed in the first wave of Victor K2s to the South Atlantic. During the Falklands Campaign, Bob was involved with many of the acclaimed long- range refuelling missions flown from Ascension Island, which included the early MRR and subsequent bombing raids in particular. For his participation in Black Buck 1 – the first bombing mission by the Vulcan against the runway at Port Stanley – Bob was awarded the Air Force Cross and his crew Queen’s Commendations for Valuable Services in the Air. Following the Argentine surrender, Bob was to return to Ascension during the following months where the Tanker Force was pivotal in maintaining the Air Bridge to the Falkland Islands. Recommended for test pilot training at the end of the year, Bob graduated from the Empire Test Pilots’ School at Boscombe Down in December 1983. In the aftermath of the Falklands War, with the impending introduction of the RAF’s first wide body tanker, Bob’s considerable AAR expertise would be employed extensively over the next 3 years, as refuelling trials on Tristar, Nimrod, Hercules and VC10 in particular became paramount. 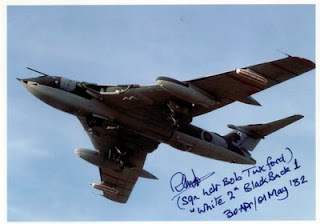 The varied nature of trials flying gave Bob the opportunity to fly many other types during his tenure on the Heavy Aircraft Test Squadron: the Hawk, Hunter, Canberra, and the world’s last airworthy Comet 4c. Piston types regularly flown included the Harvard, Basset and Chieftain, not to mention an historic Sea Fury. Finishing as B Sqn’s Senior Test Pilot, rather than face his first ground tour since graduating as a pilot, Bob exercised his option to leave the RAF at the end of his tp tour. For the next 23 years, Bob was employed by Monarch Airlines Limited and flew mainly out of London Gatwick Airport. Initially involved in charter flying on the Boeing 737-300 operating throughout Europe and North Africa, a command course on the longer range B757 resulted in long haul flights to the USA, Africa, the Middle East and Far East. After conversions to the newly introduced fly-by-wire Airbus A320, A321 and later the A330, much of Bob’s latter years were employed flying the worldwide long haul charter routes. As a Senior Captain, Bob took a voluntary redundancy scheme on offer in January 2010, and retired with over 19000 hours and some 50 types in his logbook. In his spare time when not playing golf, he re-acquainted himself with XM715, and became one of the operating taxy pilots of Bruntingthorpe’s Cold War Jets.